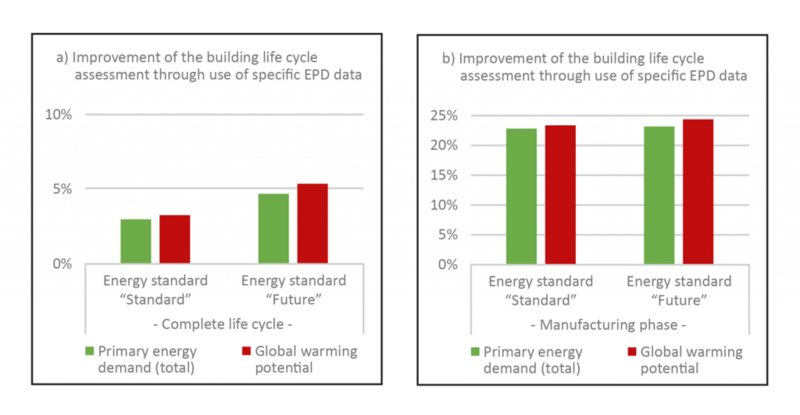 EPDs to optimise building life cycle assessment | Institut Bauen und Umwelt e.V. When a building is certified, for example using the DGNB system – the system developed by the German Sustainable Building Council – its ecological performance is rated based on factors including the key figures from its life cycle assessment. The building life cycle assessment (LCA) can either be based on generic, less sound data or on manufacturer-specific and independently verified product data from Environmental Product Declarations, or EPDs. A study commissioned by the Institut Bauen und Umwelt e.V. (IBU) at the Fraunhofer Institute for Building Physics (IBP) examined whether and to what extent the building LCA improves when using EPD data compared with generic data. The study also investigated how the different data bases affect the DGNB assessment of a building’s individual environmental indicators. The life cycle assessment of a building, i.e. its ecological footprint, is made up of the environmental impacts of the building fabric (including mining of raw materials, production, maintenance and disposal) and the cost of running the building (e.g. electricity and heat requirements). In buildings with high energy requirements, the total environmental impact is dominated by the utilisation phase. In “3-litre houses”, on the other hand, the ratio between the building fabric and the utilisation phase is virtually balanced. “The more energy-efficient the buildings become, the higher the ratio of the building fabric in the environmental impact of the building”, explains study author Dr. Ing. Johannes Gantner. “As a result, the importance of building materials will continue to increase and planners and builders are focusing more attention on the selection of materials”. The LCA data sets distinguish between generic data and manufacturer-specific EPD data. Generic data is calculated on the basis of generally available statistics and other sources of literature and made available, for example, in the ÖKOBAUDAT, a Federal Government life cycle assessment database. Generic data is associated with a high degree of uncertainty and was used especially in the infancy of building sustainability assessments, when only a small number of manufacturers were able to provide individual key figures in the form of EPDs. In contrast, EPDs are based on the actual production data from a specific manufacturer or manufacturer group. EPDs from the IBU must be reviewed by an independent third party prior to publication; in this respect, the LCA data they contain has a high degree of certainty and – according to DGNB requirements – should be used in preference to general, generic LCA data. The study carried out by the IBP is based on a representative office building in solid construction for which the building products and the energy requirements for two energy standards (“standard” and “future”) were determined in advance. For both building variants, the environmental effects were first calculated using generic data from the ÖKOBAUDAT (as at 2016). For the comparative analysis, the generic building materials data was then replaced with data from manufacturer-specific EPDs. The replacement cycles and energy consumption were calculated for a period of 50 years, in accordance with the DGNB requirements. The results of the LCA from the four scenarios examined (“standard” and “future” energy demand and “ÖKOBAUDAT” database vs. “EPDs”) show that the use of specific EPD data in the “standard” energy requirement scenario results in an environmental impact that is approximately 3–5% lower on average. In the “future” energy standard, this effect increases to around 5–7% depending on the environmental impact considered, due to the reduced influence of the utilisation phase (Fig. 2a). Dr. Johannes Gantner explains: “The potential for optimisation through the use of specific EPDs is due in particular to the high impact of the production phase (see Fig. 2b). Therefore as the net energy requirements of buildings decreases, the use of products with specific EPDs pays off even more”. Fig.3: The use of products with specific EPDs has a positive effect on the evaluation of environmental indicators used for building certification using the DGNB system. © Institut Bauen und Umwelt e.V. 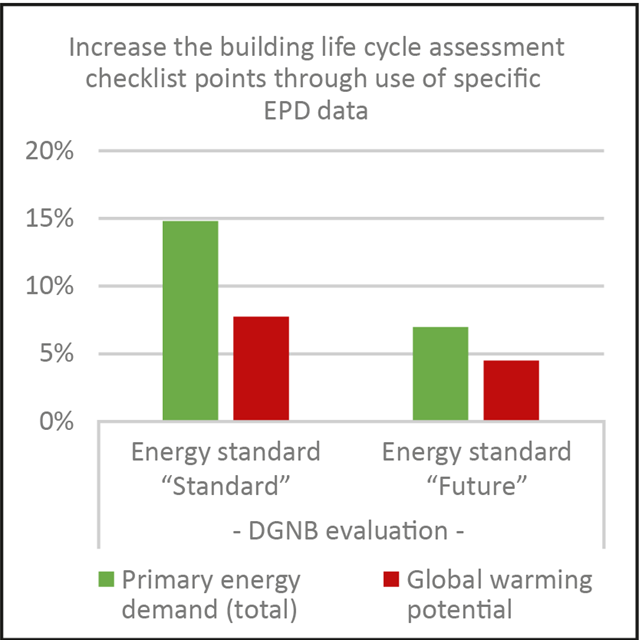 In addition to calculating the building life cycle assessments, the authors also addressed the question of how replacing generic data with EPD data would affect the assessment within the building certification based on the evaluation system developed by the German Sustainable Building Council (DGNB). For this purpose, they determined the DGNB scores of the individual environmental indicators for the relevant LCA criteria. Depending on the environmental impact considered, the use of specific EPD data in the “standard” scenario results in an approx. 4–15% higher score for the check list points (Fig. 3). In the “future” scenario, swapping the data base for the life cycle assessment has a lesser impact. Due to the energy-efficient construction, best ratings that are close to the DGNB target values can also be achieved in this scenario using generic average data. However, it is important to consider that the DGNB in turn is placing increasingly high demands on the energy efficiency of buildings. If the benchmark were to be adjusted in the future, the LCA data used would have a greater impact again, even for buildings with a future-oriented energy standard. Hans Peters, Chairman of the IBU Board, is satisfied with the results: “The study clearly demonstrated that the use of specific EPDs in building life cycle assessments is worthwhile. The developments in the field of energy-efficient construction will lead to the positive effects of the use of EPDs – which are already clearly visible – increasing yet further in the future. This sends an important signal to our members and all those interested in construction”. The complete study (in German language) can be downloaded here .